Do you remember when the internet was new? Back then I had three reoccurring thoughts. Some businesses would actually be losing money by having a web site. Most of the stuff I found on the Internet was junk. Like worthless trinkets you would win at a carnival midway, then promptly throw away. Welcome to my trinkets on the midway section. If you're lucky enough to have QuickTime and a computer and browser that aren't hostile to QuickTime, you can enjoy these novelties that probably aren't worth the time to download. I have seen these work on a PC with Netscape 7.0 and QuickTime. Need I say more? 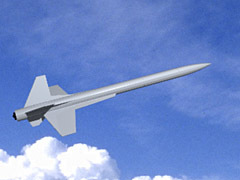 A spinning 3D rendering of a Quest Intruder. If you liked the first one, why not? A 3D rendering of a PML Intruder.